Serves in the Civil War. Pioneer in the Surgery of Appendicitis. Pioneer of Free Public Baths. American physician; born at Schwersenz, Prussia, July 29, 1840; educated at the Royal Gymnasium, Posen. Emigrating at an early age to America, he studied at the medical colleges of South Carolina and Virginia, obtaining his diploma in 1862. He immediately entered the Confederate army, serving for three years at the front and participating in all the battles of the army of northern Virginia. He was twice captured, at South Mountain and at Gettysburg. Among his contributions to the literature of military surgery, an essay on "Bayonet Wounds" attracted much attention. At the close of the war he organized and was in charge of the General Hospital at Thomasville, N. C.
In 1874 Baruch was elected president of the State Medical Association of South Carolina, and in 1880 was appointed on the state board of health, as chairman of which he made a report on vaccination, which resulted in the first legislative action on the subject in the state. In 1881 Baruch removed to New York, and later became consulting physician and surgeon to the New York Juvenile Asylum, a position he held for many years. 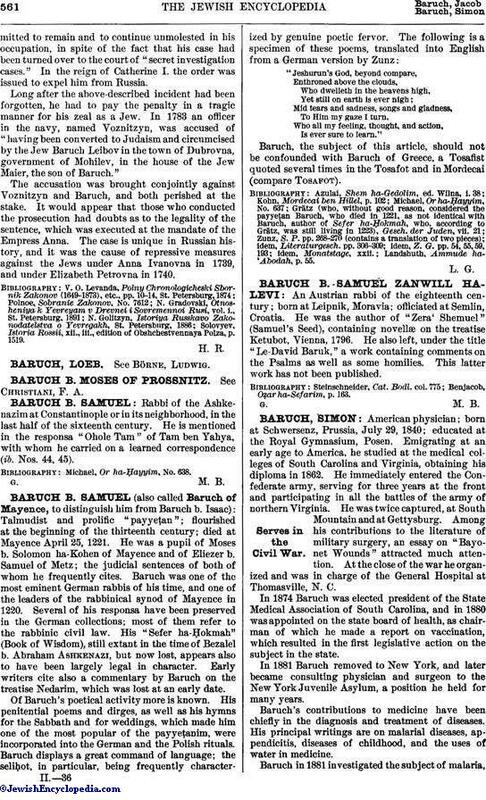 Baruch's contributions to medicine have been chiefly in the diagnosis and treatment of diseases. His principal writings are on malarial diseases, appendicitis, diseases of childhood, and the uses of water in medicine. Baruch in 1881 investigated the subject of malaria,and in a series of articles ("Medical Record," 1883) showed that malarial diseases are very rarely fatal in temperate climates, basing his study upon observations in the South extending over fifteen years. Although his views were not accepted at the time, they were confirmed ten years later by Professor Osler of Johns Hopkins University and Dr. James, chief of the New York Vanderbilt Clinic. Another subject that attracted Baruch's attention was the fatality of appendicitis when treated medically only, as was then the custom. Baruch's insistence on the need of operation in a certain case, and his subsequent contributions to the diagnosis of appendicitis, make him the pioneer of this beneficent revolution in surgery. Dr. J. A. Wyeth, an eminent surgeon, stated before the New York Academy of Medicine that "the profession and humanity owe more to Dr. Baruch than to any other one man for the development of the surgery of appendicitis" (report in "American Medical and Surgical Bulletin," March, 1884). A larger field in the treatment of diseases awaited Baruch's cultivation. He contended that the physician's chief reliance should be on the agents which maintain health—food, cleanliness, exercise, rest, water taken internally and externally. By various addresses, essays, and as editor of the "Dietetic and Hygienic Gazette," of the "Journal of Balneology," and of "Gaillard's Medical Journal," Dr. Baruch made propaganda upon the natural remedies and especially the uses of water; and in 1892 his book on "The Uses of Water in Modern Medicine" was published in Detroit. Being the first work on this subject in the English language, it created much interest, and served to call the attention of medical men to the valuable results of hydrotherapy, and to the scientific basis upon which water should be established as a remedy. The book was translated into German and published in Stuttgart, receiving in Germany similar high encomiums to those it had gained in America. 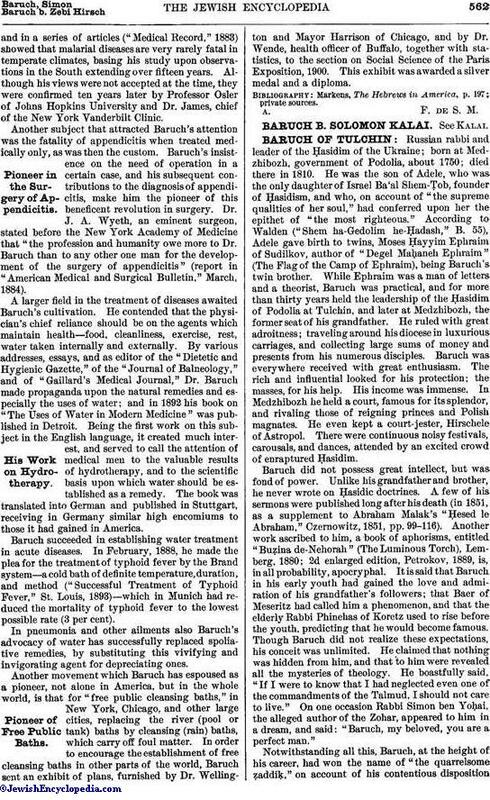 Baruch succeeded in establishing water treatment in acute diseases. In February, 1888, he made the plea for the treatment of typhoid fever by the Brand system—a cold bath of definite temperature, duration, and method ("Successful Treatment of Typhoid Fever," St. Louis, 1893)—which in Munich had reduced the mortality of typhoid fever to the lowest possible rate (3 per cent). In pneumonia and other ailments also Baruch's advocacy of water has successfully replaced spoliative remedies, by substituting this vivifying and invigorating agent for depreciating ones. Another movement which Baruch has espoused as a pioneer, not alone in America, but in the whole world, is that for "free public cleansing baths," in New York, Chicago, and other large cities, replacing the river (pool or tank) baths by cleansing (rain) baths, which carry off foul matter. In order to encourage the establishment of free cleansing baths in other parts of the world, Baruch sent an exhibit of plans, furnished by Dr. Wellington and Mayor Harrison of Chicago, and by Dr. Wende, health officer of Buffalo, together with statistics, to the section on Social Science of the Paris Exposition, 1900. This exhibit was awarded a silver medal and a diploma. Markens, The Hebrews in America, p. 197; private sources.